FIGURE 38 represents a lady of quality in the fashionable dress of William and Mary’s reign. Her gown is of rich silk trimmed with pretintailles*, or patterns cut out and laid on in rows across the petticoat. The flounce is edged with gold lace, also the gown which is looped back to show the underskirt. The stomacher is stiff and high; the sleeves loose, ending below the elbow with full ruffles of lace to match the commode head-dress, which has long streamers down the back. The hair is worn low and in soft loose curls on the forehead. FIGURE 39 is a typical dress of a child of the period. In this case it is of blue Holland, but silk and brocade were much used. Apron with bib is of white linen. Under the loose silken hood is a close-fitting cap of linen which was always worn by little children and sometimes beautifully embroidered. 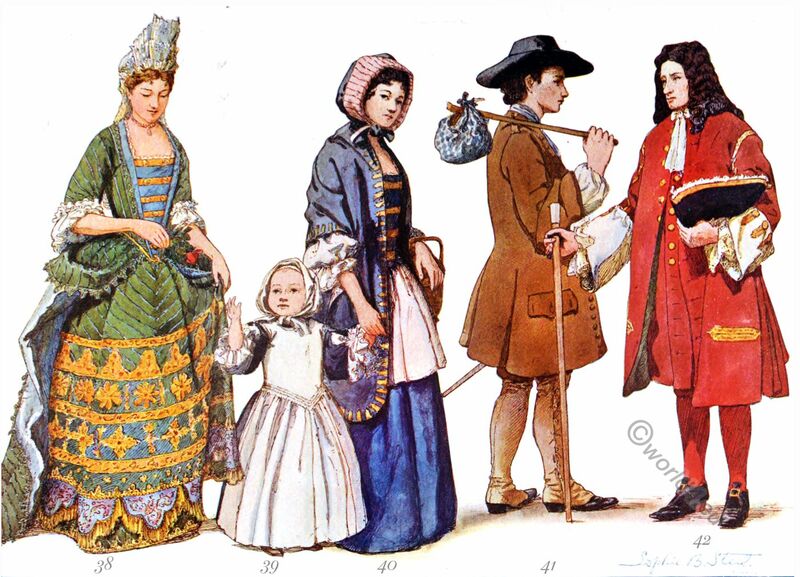 FIGURE 40 shows the outdoor costume of a tradeswoman late in the seventeenth century. Her gown is of woolen fabric, paragon or linsey-woolsey, made with sleeves short enough to show the under sleeves of white kenting which reach a little below the elbow. Her mantle is of durant trimmed with bands of gimp. The hood is of black ducape (heavy corded silk dress fabric) and is the popular style of head covering of that period. It is lined and turned hack round the face with sarsinet of a contrasting color. wide-brimmed hat is of coarse felt. FIGURE 42 represents a gentleman of ‘William and Mary’s day, costumed in dark red broadcloth trimmed with gold braid and gold buttons. He wears a cravat of fine linen with lace ends, and carries his three-cornered hat edged with feathers, rather than crush his voluminous periwig. His shoes have small buckles rather high on the instep. * PRETINTAILLES, s. f. (Fashions.) the falbalas, the fringes, the embellishments that are put on women’s petticoats & their dresses. Source: Historic dress 1607 to 1800 by Elisabeth McClellan. Published London 1904. This entry was posted in 1685, 1700, 17th Century, Baroque, British fashion history, England and tagged Baroque fashion on 5/2/18 by world4.